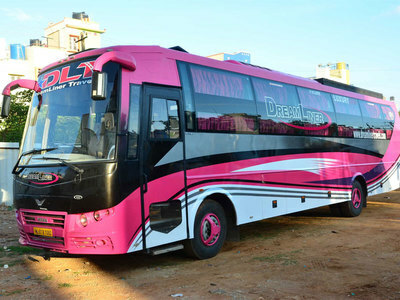 DreamLiner Travels is a renowned brand in the bus operating industry. Our vision is to give a new face to the bus industry. Since our inception passenger comfort was our top priority. We have frequently added luxury buses to our huge fleet of buses. The only thing we focus on is that the comfort quotient of our passengers should never be compromised. We have always tried our best to push our limits in order to develop our travel experience. Read further to understand what we offer that enhances our reputation in the market. We at DreamLiner Travels strive to maintain the most reasonable rates in the market. This also makes our passengers happy and thus we further give them discount offers on a regular basis to enhance their happiness. I travelled from Chennai in DreamLiner Travels last weekend. The bus was very well maintained and my berth was very comfy. The only thing which bothered me a bit was the gangway which was little narrow. Rest everything was fine. The driver was very cool and easy-going. Responded nicely to me. He also stopped the bus at the intermediate stops. It was a friendly atmosphere and I enjoyed the journey thoroughly. No unnecessary halts because of which we could reach our destination on time. I was travelling with DreamLiner Travels from Coimbatore with my 1 year old daughter. The staff was very helpful and showed special attention towards the well-being of my toddler. I would like to thank DreamLiner Travels for their courteous attitude. I travel a lot for work from Kochi in buses and have travelled with almost all bus services. Since my first ride with DreamLiner Travels I have been their regular customer. The reason is their luxurious buses and their reasonable rates. Truly very satisfied. My journey from Bangalore with DreamLiner Travels was too good. Although, it was a long journey I enjoyed it. Nice amenities and a luxurious bus! I couldn't wish for a better bus. I chose the single berth which was cozy. The drivers were very humble and they took good care to make our journey smooth. No sudden breaks / rash driving. I wasn't much tired after taking up such a long journey. Nice journey and great service.